If you are a regular visitor to our blog you may already be familiar with our Library Legends. These are guests who visit our Centenary Library and discuss their favourite books with the boys. If you want to find out more about our Library Legends then why not take a look at these previous posts featuring Library Legends: Ms Verdon and Mr Timms. Our Library Legends are wonderful people so, with that in mind, a new library award system has begun. Allow me to introduce you to the “League of Honourary Library Legends”. Each term a small group of students will be inducted into the League. Not just anyone can enter the League of course, only those proven worthy may be invited. As we have so many wonderful students here at Brisbane Grammar School, it will be difficult to select the boys each term. Today, the first three students have been chosen and have received their certificates and prizes. Jack, Seneth and Cale are now officially Honourary Library Legends. Jack has assisted the library by taking amazing photographs at library events. He has always been eager to do this and the quality of his work speaks for itself. If a picture says a thousand words then Jack’s pictures speak volumes and always capture the moment beautifully. Jack has also proven himself to be very reliable; if he says he will do something he does it. 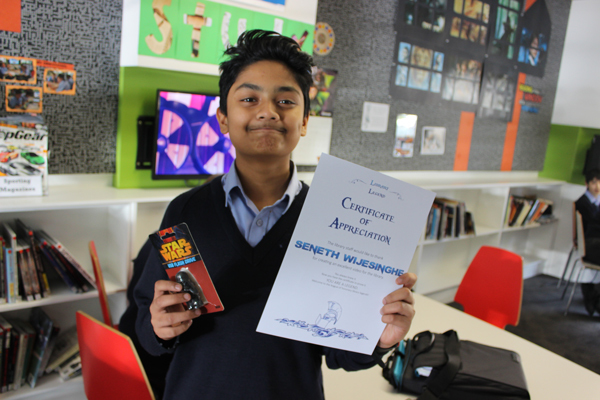 Seneth has recently created for the library a video of the Star Wars Droid Races. Now, anyone who knows anything about video editing knows that this is a very time consuming process, especially to create such an effective video as this one. This was not a simple afternoon of editing: instead of doing homework, Seneth gave up much of his weekend to create this for us and his efforts were greatly appreciated by the library. 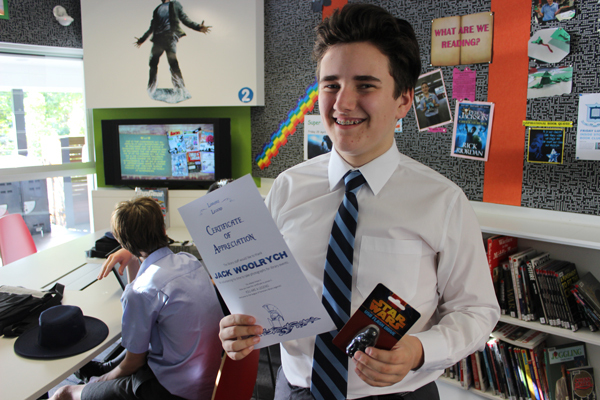 Mr Russell is proud of the efforts of both Jack and Seneth, who are members of the Digital Media Group. They are certainly putting their skills to good use. Well done guys! 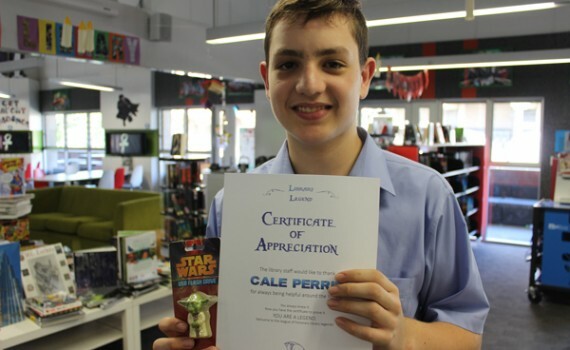 Our final student to enter the League this term is Cale. 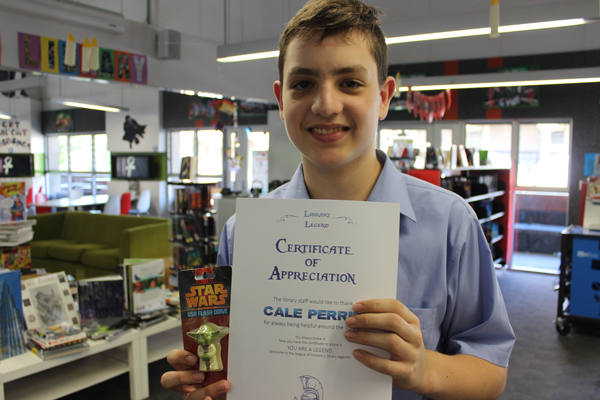 The library staff wanted to reward someone who regularly helped in many ways. This person needed to be someone who was a positive influence on others and generally a great example of a Grammar Man. Cale fitted the role perfectly. He has often been seen helping tidy the Library and re-shelve book and offers to do anything else that needs to be done. A very big thanks to Cale, as his help is really appreciated. There were a few others who were considered for the awards. Keep up the good work boys, as we are inducting new members into the “League of Honourary Legends” again next term!